Everyone loves gems -- They come in all shapes, sizes, and colors and have the capacity to instantly enliven the spirit, especially when they bring rich rewards with them. Gems Gems Gems an online free to play casino slot developed by WMS, fulfills your desire for gems and your need to try out your luck every now and then. 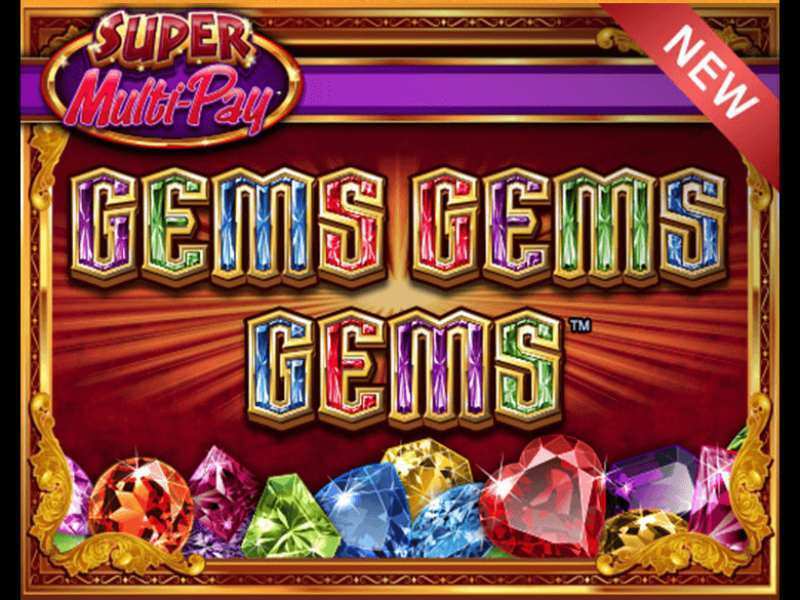 The principal theme of Gems Gems Gems slots is, as the name suggests, is based on various brightly colored gems and jewels, which gives the player a happy and joyous experience during gameplay, an experience which is further propounded by wonderful music to go along with the gameplay. Gems Gems Gems slots have been made available for online play a few years ago, thus enabling interested people to play Gems Gems Gems online, which is free to play and there is no download or registration or signup required for playing, while the rewards for winning are in real money, depending on the bet amount. When you want to set the reels in motion, waiting to unlock the riches which you may obtain if lady luck is on your side, look for the “Spin” button on the interface and click on it. The reels should begin to roll as a result. The “Paytable” feature can be found on the interface, which displays all the info relating to the slots, such as the payout for landing particular combinations of the gems, the features, rows of the slots and so on. It acts as a go-to option whenever you want to check on any particular aspect of the slots. The “Balance” feature allows the player to view the total credits left for him to play with, in the form of coins available. The game ends in a loss for the player when the total credits, i.e the total number of coins available for betting becomes zero. The “+” and “-” buttons are to be clicked in order to increase or decrease the bet placed per 2 lines. The minimum bet per 2 lines is 0.01 coins, while the maximum bet is that of 2 coins. The “Autoplay” button serves the purpose of starting the continuous spinning of the reels unless the same button is pressed again. The spin can otherwise be controlled to stop after a certain period of time or achievement of a certain number of coins, by specifying the same under the “Options” button provided on the interface. Gems Gems Gems slots, in totality, comprises of 12 symbols, of which 10 are regular symbols, 1 is the Wild symbol and the last being the Scatter symbol. The regular symbols are all various gems of different colors, such as purple, red, orange, yellow, green or pink. The Scatter symbol is a Blue Diamond, that is almost transparent. The Wild symbol is represented by the Logo of the game. Landing particular sets of combinations of the regular symbols result in various payouts as per the Paytable. The Wild symbol, represented by the Logo of the game, if landed, acts as any of the other regular symbols to form a winning combination, except the Scatter symbol. A set of the Wild symbol is also transferred to the 3 smaller screens to increase the odds of the player of landing a winning combination by creating more matches. The Scatter symbol, when landed at least 3 and up to 5 in number, rewards the player with 10 free spins and a 3x multiplier on the bet amount and subsequently, on landing the same in 2, 3 or 4 screens, multipliers of 6x, 9x or 12x respectively may be obtained, in addition to the 10 free spins. Gems Gems Gems slots are one of the best online casino slot games for those who do not want to bet big but expect regular and big bonus returns on the bets they place. That, perhaps, is the reason for it being very popular, in the International scenario, as well as in the UK, where it is very popular among the ‘luck-riders’. Thus, the overall package of the slots machine is quite commendable and definitely deserves the popularity which it enjoys. 0 responses to "Gems Gems Gems Slot"